If you are serious about gaming, a headset is essential. Even if you aren’t, it is still very useful. When playing a competitive shooter game like Call of Duty, Halo, or Fortnite, hearing is very important. It allows you to get the general idea of wear someone is. It is easier to figure that out when the sound is going straight into your ears. It also stops noise from coming out of the monitor or TV which is way quieter than blasting your volume to hear. Having the right size headset is something to take into consideration. Headsets generally come at different sizes straight out of the box. There isn’t really names for the sizes, some are big and some are small. If you have a smaller head, you don’t want something too big, because you usually can’t adjust it to be smaller. If you have a bigger head, most headsets have something you can adjust the size with. Very important. You need something that you can wear. I will give you a bad example, I once had a pair of wireless headphones that were optimized for gaming, music, and phone conversations. They were made of great material and felt good, but after 20 minutes, I had to take them off because they were pressing my ears and it really started to hurt. I prefer something that cups the ears rather than sits on them since it won’t rub your ears to the point where it hurts. Make sure that they are made of a comfortable material. I think that soft leather covering memory foam is probably the best option, but other things are comfortable. I used to have some sort of synthetic fabric covering memory foam, and they were very comfortable so don’t be too picky. I have kind of made the decision for you since all of these are wired, but it still is something to think about. If you do not buy a headset from our list and search on your own, make sure you know your preference. If you use wired, there is a guarantee of no delay, there might be some with wireless. But if you think the wire is annoying, it might be worth snatching a bluetooth headset. If you are someone who gets angry and rips their headset off and throws it on the ground, make sure your headset can withstand it. 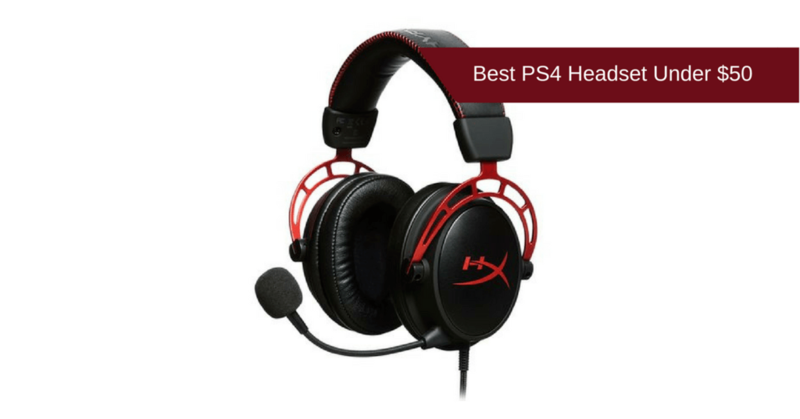 The ONIKUMA PS4 Gaming Headset is the most durable on this list, it can withstand bends and drops, maybe even some of the throws you give it. The others aren’t really renowned for their durbability, so if you fit this description, I would go with the ONIKUMA. Especially for the price, this is a good headset. It is extremely durable and will withstand all of the drops and tosses you give it. I personally get up and start jumping up and downing when I get killed stupidly and my headset usually falls off. It has good sound quality and is very comfortable and breathable, but there is one problem. The mic quality isn’t great, it is not bad, the others are just better. I would recommend this to any solo players out there. It is a really good headset for the price, and you will be able to hear everything, but if you are in a squad, you need a very reliable mic. The other headsets can offer that and all of the qualities this one has, but if you don’t need the mic, go for this one since it is cheaper. Another really good headset. It has great surround sound quality which is very important in shooter games. The actual sound quality is really, really good, and the mic sounds like you are in the same room (to the other person). There is a noise cancelling feature that blocks out the majority of the sound in the room. It has a comfortable, breathable fit, but the ear cups are a little shallow, your ear might rub against them sometimes. It is also on the bigger side, it should work fine if you have a small head though. I think that anyone would thoroughly enjoy this headset, but people with a larger head might enjoy it more. For all of the qualities it has, it is extremely cheap. But the fact that it is large starting off and can’t get any smaller holds it back from tying with the TBI Pro, anyone could fit that one to their head. Overall a very solid headset, just has a few things holding it back. This is an extremely good headset. It has great surround sound quality which I believe is essential to shooter games. That basically means that any sounds coming from in front of you will sound like they are in front of you, and same with all other directions. It blocks out all ambient background noise, and the mic blocks out all background noise. The ear cups are made of a soft, breathable leather and memory foam making for a very comfortable fit. I would recommend this to anyone without hesitation. I think that this is one of the best headsets on the market. The price is almost unbeatable, very cheap. But when you take that and make a headset with stunning quality, it is impossible to beat, and that is what this headset did. This may be my all time favorite headset, I didn’t use to use it, but now that I have discovered it, I don’t ever want to get another headset.